What is the Possible Income for an Affiliate? Do You Have a Chart to Show Possible Income? At SendOutCards, we firmly believe our income opportunity is great enough to be highly attractive, without reporting the earnings of others. Moreover, the Federal Trade Commission and several states have laws or regulations that regulate or even prohibit certain types of income claims and testimonials made by persons engaged in network marketing. While Affiliates may believe it is beneficial to provide copies of checks, or to disclose the earnings of themselves or others, such approaches have legal consequences that can negatively impact SendOutCards as well as the Affiliate making the claim. Also, due to the constant fluctuation of Affiliates, we are unable to provide an accurate number of Affiliates in any given vicinity. 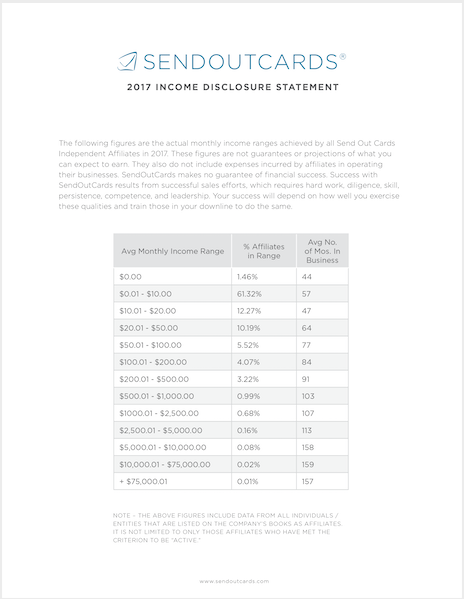 We do offer what is called an Income Disclosure Chart, which shows the average earnings for an Affiliate at each level. The information shown includes all inactive Affiliates that may not be building the business. This chart may be found below.